Page 3 of 3 Bovada Hand History Converter Software Register or Use the arrow to the right to read the other 2 page(s). Yeah, I'm a bit confused. After following the directions in the tutorial pokertracker is telling me that I played 10 hours on the 3rd of this month and played 400 hands while 4 tabling 6max....that's not possible. I'm also missing about half my winnings from that day. The converter says it found 15000 hands but I've only played 9k over the course of 2 month's. Oh and I only get duplicates when I run the hands through pokertracker now. The duplicates match hands downloaded in the converter. If your table gets down the 6 or less players, it will tag it as 6max. You have to setup your PT to auto archive the imported files, or it will list old hands as duplicates when you import. This won't effect anything, it will just list them and take a little longer to import. I hate to be a burden but I'm having a small problem. I have been using the converter without any issues until just lately. Until lately the converted hands were being moved into the original hands/export file and the original hands to the original hands file. I uploaded some hands yesterday and it took pt4 forever to upload them and then a notice I've never received before popped up asking if I wanted to choose the year the hands were played or select to have the file date used. I just click file date. When I went to upload them again today I noticed that both the new hands and the old hands were going to the same place, the original hands file. I'm unsure of why this changed or how to change it back.. Thanks for the reply. I've looked around for awhile now and I can't find anything on auto archive. Could you be really cool and tell me how to do it please? You selected the processed folder when you imported on accident instead of the converted folder if you got that message. You'll just need to re-import from the correct folder. For which database are you using? 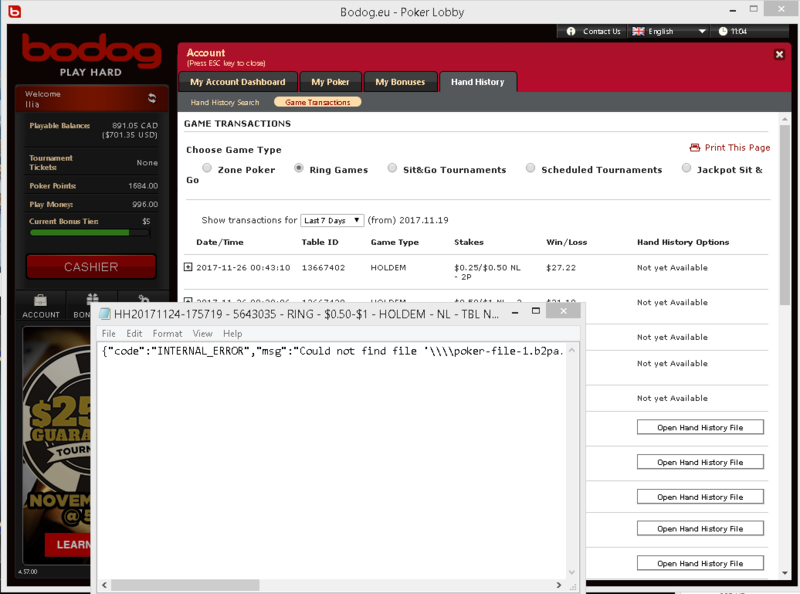 The auto archive is from the pokerstars site setup of whichever database you're using. They are different depending on which one you're using. You can also just periodically manually move the files also. Hey John, I'm noticing that all of my hand histories that are being uploaded into my pt4 are all out of order. When I go to review a session I almost never have 100bb's at the start.. I don't know if I'm loosing hands or what.. Any advice? Also, do you use pt4 or hm2? I just turned on the hud stats and it says some of my opponents have 6k hands? This can't be accurate can it? Or do the HH files and pt4 remember your opponents even though they're anonymous while playing? It's starting to seem like I am definitely loosing hands when converting them. I've been documenting the table and hand numbers of trouble spots and trying to locate those hands in pt4 and I'm unable to sometimes..
Because of the anonymous thing pt4 tracks imported bovada hands via positioning, so if you have played 6k hands then there would be roughly 1k hands vs each position (if playing 6max)....pretty much the only thing in can comment on regarding this however. Actually if you've played 6k hands, it means you've played 6k hands against each position (excluding hands where someone was sitting out or there was an empty seat). +1... have no idea why i decided to think it would be different than the # of hands you yourself played and I can't even use the excuse of it being late since it wasn't even midnight . At some point PT changed the way it counted rake, and there was an update to account for this change. But outside of that, we have zero known issues or bugs in the program and it's been that way for a long time. I'd try grabbing the latest, which is .40 and converting with that one. It hasn't been a problem since I've been running the card catcher. Ok, coolness. That's good news. I have a new beta up of the hand converter. This version is up to address a lot of the corrupted files users are getting from Bovada since their most recent update last week. Bovada apparently changed their HH format last night. So we're working on a fix, and will have an update soon. This fixes cash, S&G, and MTT hands from Bovada after their recent HH change. Support asked me to put this up because a lot of people are having issues with the new bovada hands. If you're not getting an update message when you load the converter up. Click check for updates in the upper left hand corner. Bovada changed it's HH format on 12/1/15 so you'll need to update otherwise you will get errors on hands, or hands will just be missing. bovada converter is really useful, thank you! impossible to convert hand histories for pt and hm without it. Ty... glad you're enjoying it. We stay on top of any bovada updates or changes. - Update change fix for Bovada Omaha hi/lo rake HH format. I play on bovada and I am interested in purchasing some of your products. Which combo would be a better benefit for me? I also see this written "For PokerTracker and Holdem Manager. " under the purchase options, Does that mean I need one of those for these to work? Correct... you need PT4 or HM2. Sorry, was out of town at wsop. I'd recommend the Bovada card catcher, unless you're playing a lot of zone. The card catcher plus the converter combo is good if you really want to study the game, since w/ the converter you can see all your opponents hole cards. Update for the Ignition Casino. So keep in mind this will create a new desktop logo that will launch from the Ignition Hand Converter. May Bovada RIP. Im not sure if this thread is still alive, i would like to ask some help with your Converter. i tried to renew but i dont see anything in checkout page. I'd e-mail support. They'll be able to look up your serial and provide a manual renewal link if needed. Just a quick Fyi... this is a known issue on Ignition's side. There's nothing the converter can do to resolve it. Hopefully Ignition will figure it out here soon. - Fix for specific issue w/ zone side pot hands. Do you have updated links for the downloads? Both the links above, the ones I received in April back in 2017, and the download links on your website are broken (I think they all lead to the same or very similar URLs). I haven't been on Bovada or Ignition in a while so I never bothered downloading the updates. But I'm getting back online a bit and I'm hoping they are still supported? I'm actually wondering if it's an issue on my end. I'm running Parallels to run Windows, and I run into issues when I try to use the website link to download through Parallels. But I can download it using Mac. I've done that and will try to install it on the Windows partition - will let you know if I run into problems. Thanks! I did eventually get it sorted. Not sure why the links were broken when using Parallels, but this is most likely some sort of weird Parallels problem. do you plan to make something like this for DriveHUD? or is it possible to use this one? Sorry, missed this. We're going to be adding native Bodog/Ignition hand import into Drivehud, so the hand converter here wouldn't be needed if you're using Drivehud. This hand converter is just mainly for Poker tracker and holdem manager, so you can import and track your results. Thanks, been wondering if you would add this. i miss the feature where you get to see your opponents hole cards. Yeah, we'll be adding that. You can view all opponent hole cards if you use the converter with PT and HM (.8079 version or earlier) still. Ok, for now i'm using hm2+converter for the hole cards. is there an ETA for this feature? Im guessing this is after you release LB2? So now there's no need to downgrade to the .8079 version anymore. I guess something changed again in HM2 to allow this once more. I'm hoping you saw that you can do this now in all of the latest versions of HM2.